President Donald Trump said on Friday, March 8, that he is working with the Australian prime minister on a security agreement that would exempt Australia from the recently imposed tariffs on steel and aluminum imports. 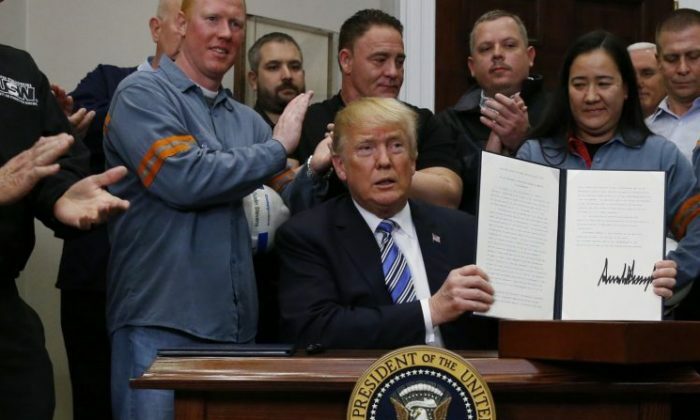 Earlier this week, Trump signed the paperwork to enact a 25 percent tariff on imported steel and a 10 percent tariff on imported aluminum. Mexico and Canada were exempted from the tariffs. Brazil, Japan, South Korea, Australia, and Europe clamored for special treatment, while Chinese producers called on Beijing to retaliate in kind. Treasury Secretary Steven Mnuchin earlier said he expects countries in addition to Mexico and Canada to be exempted in the next couple of weeks. The initial announcement caused threats of countermeasures, notably from the head of the European Union. Those threats have been overblown, according to Dani Rodrik, professor of international political economy at Harvard University’s John F. Kennedy School of Government and one of the world’s leading experts on trade. Trump imposed the tariffs based on a report from the Department of Commerce, which found that the current state of the steel and aluminum market is a threat to U.S. national security. Foreign nations, especially China, have flooded the United States with unfairly priced, subsidized steel and aluminum, forcing prices down and hurting domestic manufacturers, the report found. Trump campaigned on a promised to bring back American jobs and place American interests first.